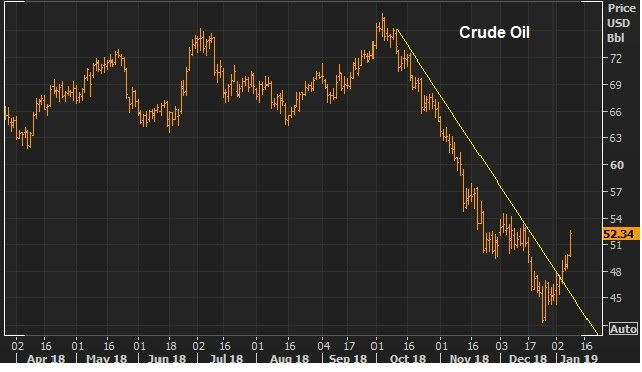 We discussed yesterday how markets might look by the end of the year, if the pontifications about a global slowdown and impending crisis are dead wrong. The reality: That is the low probability outcome. The higher probability outcome is another 3%+ year growth in the U.S. in 2019, a resolution on the Chinese trade dispute, and a rebound in emerging market growth. 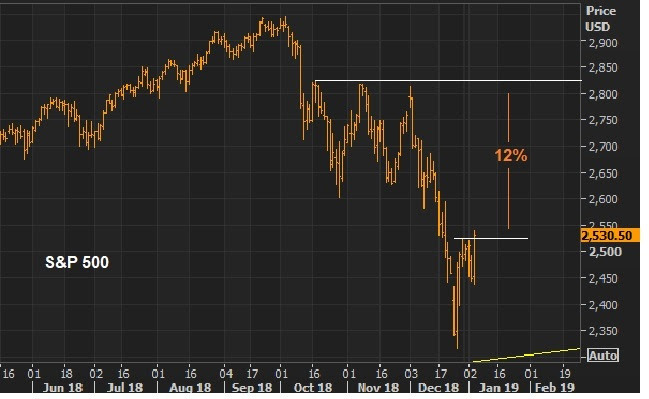 With the “high probability scenario” in mind, let’s take a look at some key charts that look very vulnerable to a sharp squeeze. Remember, oil and stocks have been in a synchronized decline since October 3. 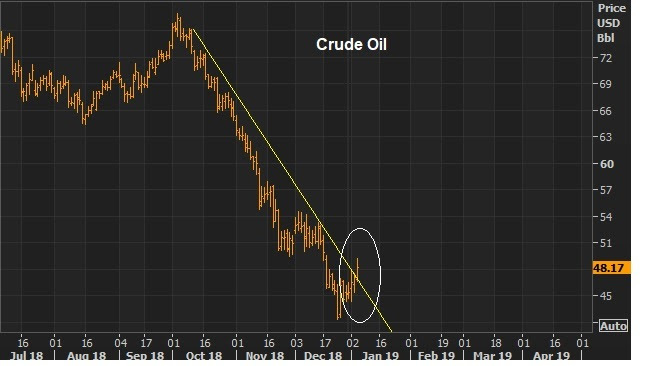 On Friday we looked at this chart on oil, and the break of the big downtrend that accompanied some rate-hike relief jawboning from the Fed. Today the chart looks like this …up almost 9% from Friday. We broke a big level on Friday at 2,520. We’re up another 2.3% since. What about yields? The fear in the interest rate market hasn’t been/wasn’t that the economy can’t withstand a 3% ten-year yield. The fear has been the speed at which the interest rate market was moving, and the methodical tightening process of the Fed. Would 3% quickly become 4%? The Fed has now backed off. That quells the fears of a “too far, too fast” adjustment in rates. But the interest rate market had already been pricing in the worst case scenario (another recession and crisis, in part thanks to the Fed policy). If that was an over-reaction, I suspect we’ll see a move back toward 3%-3.25% in the 10s in the coming months. As you can see in the chart, this big line is being tested today. 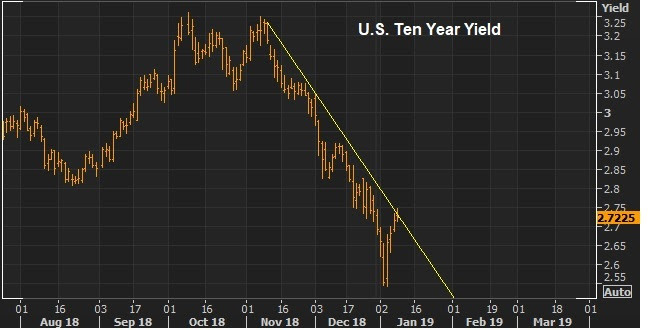 And as long as the Fed stays data dependent, not telegraphing another series of hikes, the market should accept a 3% ten year yield just fine. To sum up: Markets tend to be caught wrong-footed at the extremes — leaning too hard in one direction, with sentiment too depressed or too exuberant. And I suspect we’ve seen that extreme in Q4. Sentiment was deeply shaken by the sharp decline in stocks, and that spilled over into the outlook for global economic stability. But as we discussed yesterday, we have a Q4 earnings season upon us that is set up for positive surprises (given the sharp downward adjustment in expectations). And if Trump gives some ground to get a deal done with China, these key markets are set up for big and sharp recoveries.